HSM Pure 320s Strip-Cut Shredder is a state of the art paper shredder by HSM shredder. Designed to cater to 1-3 users in a personal or small office environment, the Pure 320s shredder is packed with appropriate specifications, additional value added features and a sturdy German made machine that ensures durability and precise shredding quality. A security level 2 shredder, the HSM2331 Pure 320s shreds paper into ¼’ strips into a 6.6-gallon bin. Approximately 18 sheets can be shredded at one time through the 9’ feed opening that can create 38 strips per page. The 320s strip-cut paper shredder also ensures to be user friendly with a practical reverse function that prevents any sort of jams during shredding. HSM Pure 320s strip-cut shredder not only shreds paper but can also shred Staples, Paper Clips, Credit/Store Cards and CD’s/DVD’s. 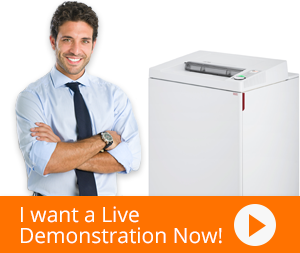 Furthermore, Pure 320s paper shredder shuts off automatically when pressure is applied to the safety element. Other features such as Energy Management Control System EcoSmart, Quiet operation, Life time warranty on cutting rollers, Low power consumption in standby mode, Jam Prevention system, Automatic On/Off and Full bin indicator boosts shredding performance.